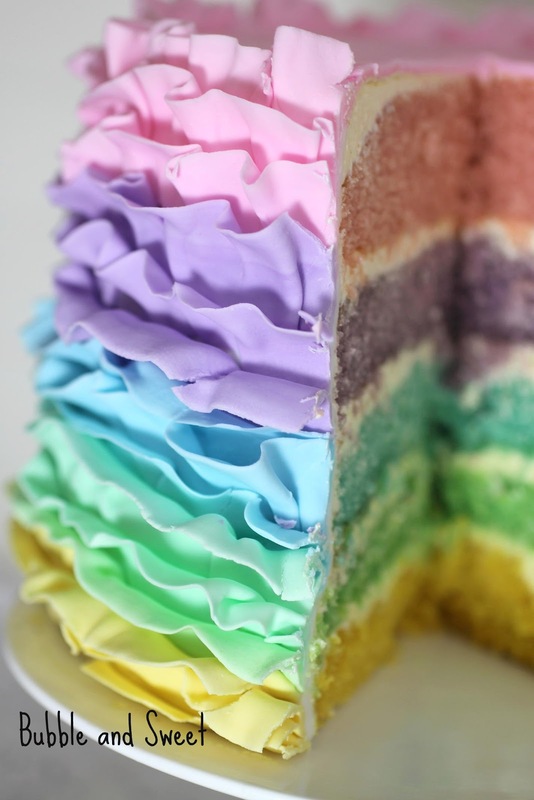 Just a quick sneak peek of the pastel rainbow ruffle cake I made up for an Easter Dessert Party table. I'll do up a tutorial for it in the next week or so, but I couldn't wait to share a couple of photo's with you. Those ruffle looks pretty! How did you do that? Hi Nash I will doing up a tutorial within the week. bought the book... now please how do you do the ruffles? Actually, make that over 120 re-pins! I just checked again. So pretty! What was the number of the piping tip you used for the ruffles? Hi will be doing up the tutorial shortly. Although the cake is covered and filled with buttercream the frills are fondant and hand rolled and frilled not piped. Yes, please do share the piping tip and how to do this amazing ruffle. Please! Love the pastels and ADORE the ruffles! Looking forward to the tutorial. Soo yummy! I just want to look at it! You are so talented! I can't wait until you post the tutorial. Thanks for sharing! That is so cute and lovely!! gorgeous!!! i love everything about this! Stunning, you are so very clever! 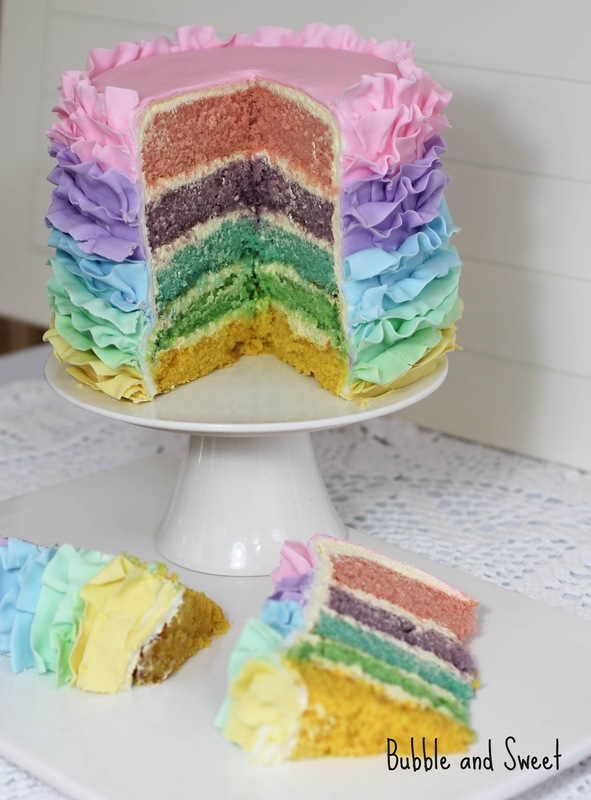 How do you make the coloured cakes? Is it as simple as adding food colour to the mix? I love it!!! Yes I used the recipe for easy vanilla buttercake from my bookbook Sweets on a Stick by Linda Vandermeer and then colored with gel food colors - not the watery ones you get from the supermarket. My friend Anna shared your photo on Facebook and I'm so glad for it! 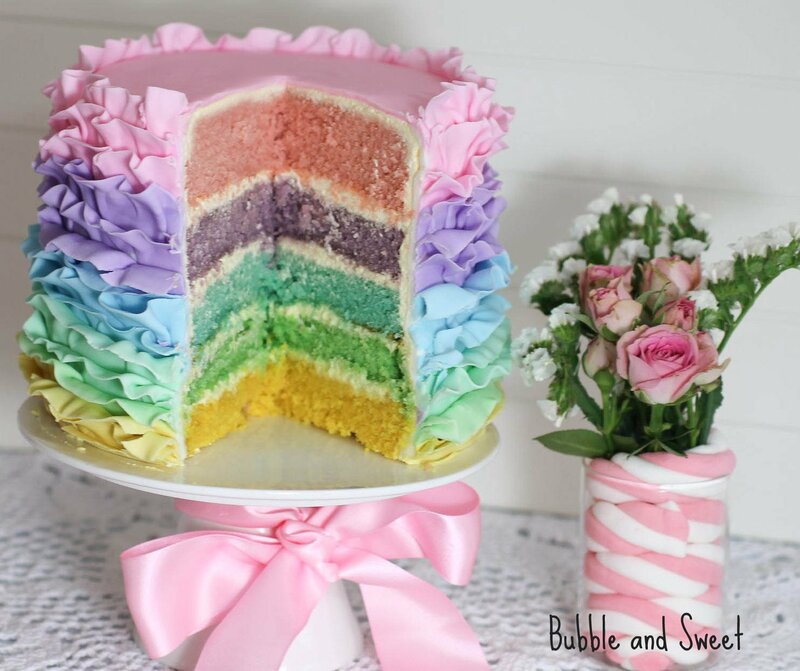 This is such an inspiring cake! gorgeous and I bet it taste amazing. I am happy to be following your fantastic blog. Oh my goodness this is gorgeous!!!!! This one is really one of beautiful cake. The Rainbow design and concept of this cake are really looking most interesting features about it. I am totally crazy to see the deliciousness of this stuff. Thanks for sharing. Hi, Linda. Very nice cake! I am very motivated to do a 6 color layers fondant rainbow cake. Wonder can I apply the buttercream as thick as yours? Because my place here is very humid and hot? Will the fondant 'melt' due to the moist of bc? 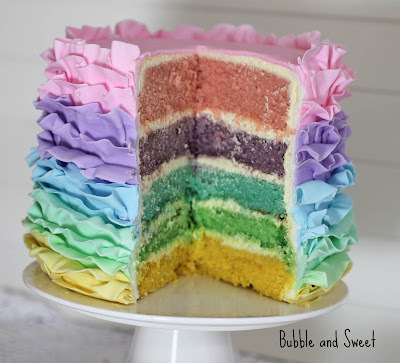 Will the BC able to hold the weight of the layers cake and fondant? Hi Monica it was actually very warm here in south east Queensland Australia when I made this cake. I used Italian Meringue Buttercream which is reasonably firm. If you are very concerned with the weight you might like to try a white chocolate ganache instead. I had no problem with the fondant melting because of buttercream. Once you have fully covered the cake like I suggest then it should set quite hard, although if the humidity is very very severe it could become a problem. I usually find when it has been raining for a few weeks to be the biggest problem and I turn on our air conditioner which has a dehumidifier. That's a stunning cake Linda, I love the technique you've used for the icing. I'll definitely have a look at the tutorial to see how it's done.